I may not be a huge fan of mint flavored ice cream, but guess what? This little guy is just the right size portion of a very well made flavor. And you know what really won me over? The soft yet flavorful little chunks of cookie. I try so many ice creams now that it was nice to dig into something besides chocolate (or chocolaty) chips. 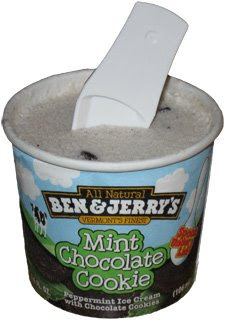 The excellent little pieces could have easily made this flavor be called mint ice cream sandwich. I will admit I chuckled a little at seeing the tiny included spoon, but to be fair to the blog, I ate the whole thing with the spoon. To my surprise, it worked really well. I was expecting hand cramps or at the very least messy fingers, but I had neither when I was done. The ice cream is typical Ben & Jerry's quality of course. A true mint flavor with a nice texture and creaminess. It's not a weak mint, but I didn't feel overpowered either ...let's call it fairly strong. I don't think I could eat a pint, but a single serving was just enough to give me a nice taste, yet not fill me up or weigh me down. If you've ever wanted to try Mint Chocolate Cookie but we're afraid to, go with the snack size.